Alison O’Donnell was a vocalist in the legendary Mellow Candle and Flibbertigibbet, two 70s folk rock groups. Alison has remained active over the years as the sometimes singer with United Bible Studies and The Owl Service, and most recently appearing on Fruits de Mer Records. Now John Blaney of Mega Dodo Records is releasing Alison’s latest solo album Climb Sheer the Fields of Peace on July 14, 2017. This album is a collection of twelve songs mixing folk and electronica, that take you in unexpected directions. 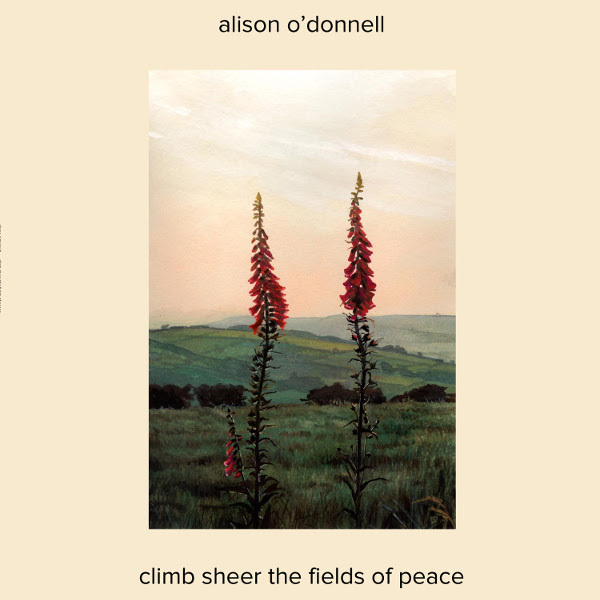 Unlike what I am used to with Mellow Candle, Flibbertigibbet, and her FdM releases, the songs on Climb Sheer the Fields of Peace are minimal, with just Alison accompanied by synths, acoustic guitar, autoharp, or harmonium. To add depth and harmony, Alison’s vocals are multi-tracked. Because Alison’s song choices are at turns unpredictable, chilling, heartbreaking, and exhilarating, it may take several listenings to appreciate her music. On the first pass through the album, the songs that grabbed my attention were “Swans There Are A-Feeding” with Alison’s breathy vocals and harmonium slowly building to a climax of multi-tracked singing, the sinister acid folk “Pathways,” and the eerie dark sisters on “Memorial,” a song both beautiful and sad which includes the album title as the refrain. After 45 years Alison’s voice continues to please and alternately sooth the soul or send shivers down your spine.